Hibs striker Farid El Alagui will continue his long haul back to full fitness when he makes his first public appearance of the season in tonight’s SPFL Development League clash against Ross County in Dingwall. El Alagui, who missed almost all of last season after suffering a ruptured achilles tendon, began his comeback by scoring a hat-trick in a closed-doors match against Dundee, playing for an hour. 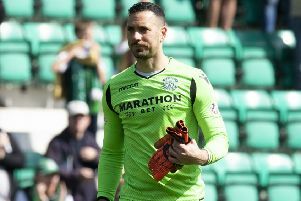 Now, having suffered no reaction from that outing seven days ago, the 30-year-old will begin his first competitive match albeit alongside the Easter Road club’s youngsters. Boss Alan Stubbs said: “I think Farid will play for around sixty or seventy minutes depending on how he feels. El Alagui will make the long trip up the A9 along with fellow striker Jamie Insall, the former English non-league player making a surprise appearance on the bench for the weekend win over Queen of the South at Palmerston Park. But, Stubbs revealed, that was more down to the fact seven first-team players were unavailable through injury. He said: “It was purely because of numbers that Jamie and Oli Shaw were on the bench. Stubbs, however, is hoping that squad numbers will be much healthier following the international break with Fraser Fyvie, Jordon Forster, James Keatings and Islam Feruz having all returned to training yesterday. He said: “The break doesn’t mean it will be a complete rest, the boys will be working hard.